I'm not sure I like the new logo either but I am not opposed to a colour change if it means more people take another look at Green values. I think the old colour scheme looked weak (sorry, I associate yellow with weak). As much as we hate to admit it, much of politics is about packaging. If Greens want our values and ideas in the legislature of Alberta don't we need to consider all strategies. I do agree it's jarring to have the word 'Green' in blue, but maybe that was the intent. If the colour of conservatism is blue and Greens are all about conserving resources what is the trouble with the colour association here? Albertans are ready for change. We no longer trust the PCs but many Albertans still consider themselves conservative (not necessarily big C Cons). You seem to have had a visceral reation to the change. 2+2 never equals 5 but you can write the equation 2+2=5 in any colour, can't you? January 8, 2009 at 1:12 p.m.
At the end of your piece on the logo, you write that Green values are not being advanced by the new executive of the Party. I was part of the group who worked on the new constitution and bylaws and I believe Green values make up the essence of both documents. I know that you disapprove of the change in leadership, but our values are now even more firmly embedded in the constitution and bylaws than ever before. In comparison to the old versions, the new ones are miles ahead... yet they are not finished and always open to amendment by members. I urge other readers of Grant's blog to look at the constitution and bylaws for themselves. 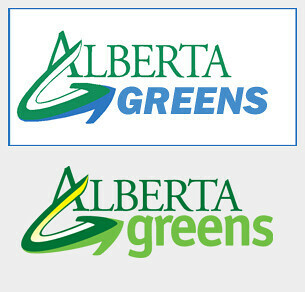 They are posted on the Alberta Greens website for everyone to see. Rest assured, these are living documents and fully open to amendment by members. If there is something in either document that needs to be changed, let's get together and make changes. January 8, 2009 at 1:44 p.m.